Maracaibo also has the most varied street food. Every corner has a “bodegita” (small store), which is usually the back of someone’s house in the neighborhood, and they are usually known for some type of food snack or specialty. You will have the bodegita with the empanadas, or the bodegita that sells the raspadiotos (ice cones) or the one that sells the homemade cakes – you can pretty much have a full meal around the neighborhood just by walking it. I first tried a Patacon in Maracaibo - made from sliced green unripe plantains, which are cut either lengthwise or widthwise and are twice fried. You could eat them as chips or crips. But, in Maracaibo they have elevated them and use them instead of bread – have you ever tried a Patacon hamburger? You have no idea what you are missing. A couple of weeks ago I was going through my cookbook library and came across the recipe and realized that I had everything I needed to whip them up and that is what I did, for breakfast. They were just as tasty as I remember them – sweet, with a bit of a tang from the queso blanco. 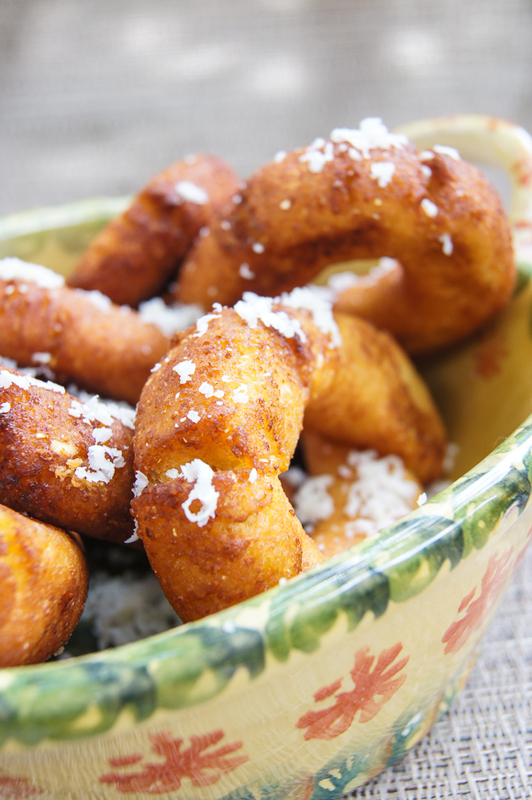 They are a cross between a hush puppies and the batter used for corn dogs – which is not a bad thing if you ask me. I hope you enjoy a bit of my birth country in your kitchen. Slice plantain crosswise into about 5 pieces, then place in a saucepan and cover with water. Simmer gently until tender, about 15-20 minutes. Drain and let plantain cool enough to handle, then peel and mash well (or purée in a food processor or blender). Stir cornmeal, plantain, salt, anise seed, sugar and finely grated cheese together with a wooden spoon. Add water slowly, a couple of tablespoons at a time, until mixture comes together into a dough. The dough should be soft and knead able, but not sticky. Let dough rest for ten minutes. Heat several inches of oil to 350 degrees. Divide dough into 16 pieces, and roll each one into a smooth ball. (If dough is too wet and sticky, add more cornmeal). Take each ball and roll into a log shape with the palms of your hands. Continue to roll into a cylinder on a counter top, until dough cylinder is 6-7 inches long. Bring ends together and overlap them to form a tear-shaped loop. Press ends together. Repeat with other pieces of dough. 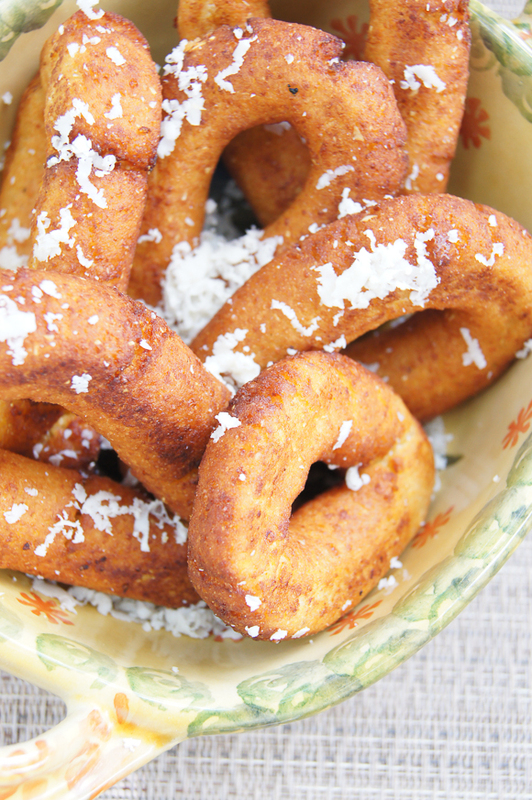 Fry loops of dough in oil until dark golden brown, turning once. Serve mandocas warm, with slices of queso fresco and/or butter.